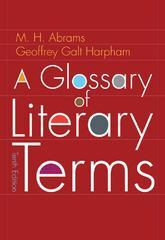 A Glossary of Literary Terms 11 Edition First published over fifty years ago, A GLOSSARY OF LITERARY TERMS remains an essential resource for all serious students of literature. Now fully updated to reflect the latest scholarship on recent and rapidly evolving critical theories, the new contains a complete glossary of essential literary terms presented as a series of engaging, beautifully crafted, essays that explore the terms, place them in context, and suggest related entries and additional reading. This indispensable, authoritative, and highly affordable reference covers terms useful in discussing literature and literary history, theory, and criticism. Perfect as a core text for introductory literary theory or as a supplement to any literature course, this classic work is an invaluable reference that you can use throughout your academic and professional careers.